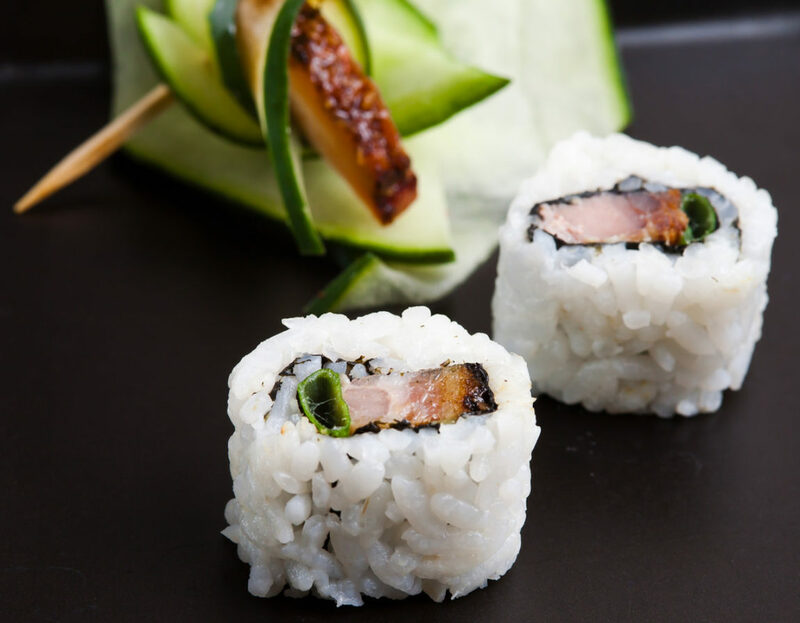 Maki sushi is probably the most well known type of sushi in the U.S. 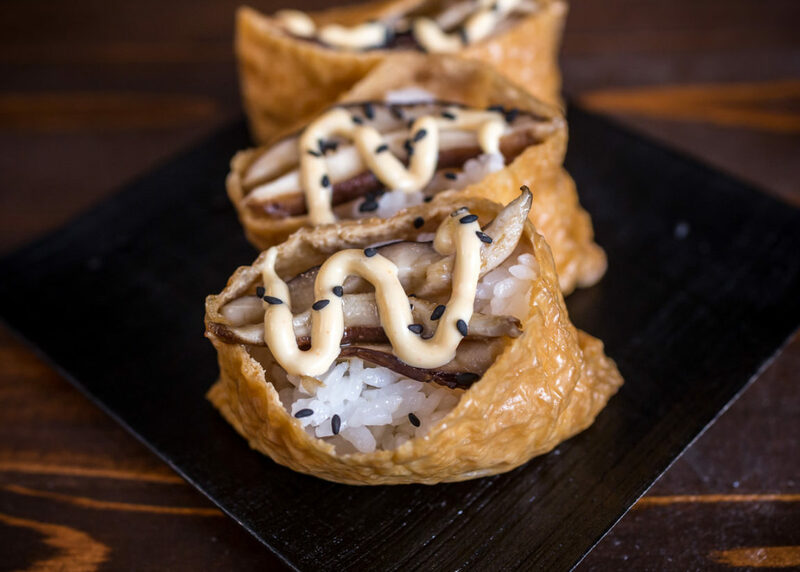 It consists of a layer of nori surrounding a layer of rice surrounding the fillings in the middle, all rolled into a cylinder and then cut into several smaller slices. 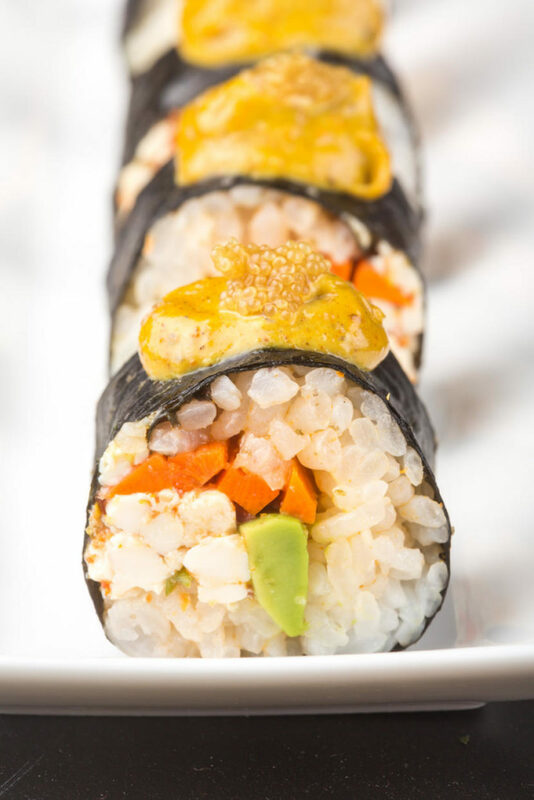 The most well known type of maki sushi is the California Roll. <span class="bigPic"> <img src="http://img.fridgg.com/540w_18640000_75___farm5.static.flickr.com/4056/5147830780_cec2c7fe56_b.jpg" alt=""/> </span> <p>Lately we've been trying to get a little more creative with the things we make here. After I mixed the honey-rice vinegar marinade (inspired by the ingredients list from a package of gari), I tasted it and thought it tasted just like lemon tea with honey.</p> <p>So what goes better with those flavors than... green tea! But once we tried it, the roll was good, but... missing something. 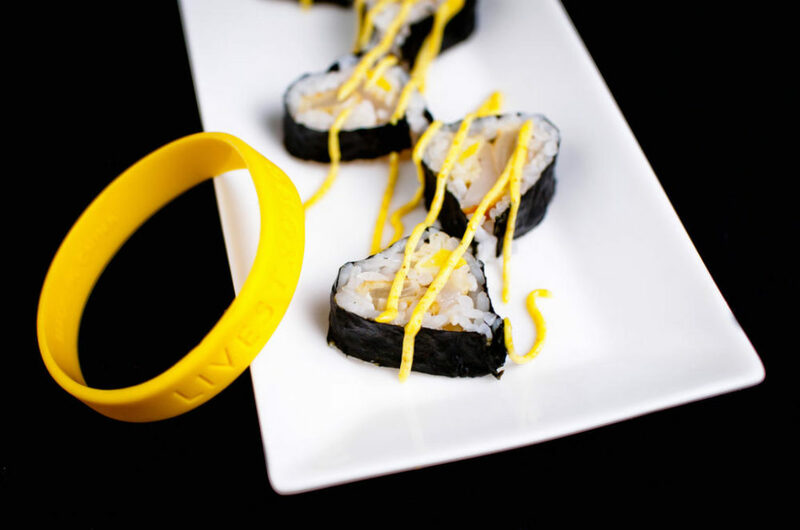 Happy Fourth Birthday, Sushi Day! <span class="bigPic"> <img src="http://img.fridgg.com/540w_18640000_75___farm5.static.flickr.com/4145/5056671268_788ab91c55_b.jpg" alt=""/> </span> This heart is for my little brother. This heart is for my dad. This heart is for all of my friends and family who are or have ever had to suffer through cancer. I wish I could take all the hurt away. (These hearts are also for Barbara Harris' event, <a href="http://www.winosandfoodies.com/2010/08/livestrong-with-a-taste-of-yellow-2010-heart-series.html">LiveSTRONG with a Taste of Yellow 2010 - Heart Series</a>.) <span class="bigPic"> <img src="http://img.fridgg.com/540w_18640000_75___farm5.static.flickr.com/4147/5056055641_9a0775b461_b.jpg" alt=""/> </span> <div id="recipe-tabs" class="clrself"> <p class="hd-top"><!-- --></p> <ul class="anchors"> <li><a href="#recipe">Recipe</a></li> <li><a href="#nutrition-data">Nutrition Info</a></li> </ul> <p class="hd"><!-- --></p> <div id="recipe"